The son of immigrant parents, Garcia hail from the historic Little Village neighborhood on Chicago’s south side. After graduating from John F. Kennedy High School, Garcia joined the U.S. Marine Corps, serving three tours of duty in Iraq and Afghanistan, earning multiple decorations. After his return to Illinois, he became a staunch advocate for student veterans, founding the Student Veterans Club at Northeastern Illinois University and rising to the pinnacle leadership position at Student Veterans of America (SVA). 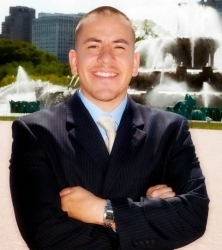 Garcia was a member of the Illinois Veterans Advisory Council from 2010-2011 and was recognized as the Illinois Veteran of the Month for September 2010 prior to joining IDVA.